Vienna Capital Partners, the Austrian private equity investor, which owns the firm that published Hungary’s now defunct Népszabadság daily, seems to be providing such a stark example of corporate greed and irresponsibility that political foes and economic rivals from all across the spectrum are joining together in protest. Hungarian conservative publications, left-centre publications, a newspaper in Slovakia and even Hungary’s far-right Jobbik party have issued blistering condemnations following the sudden shuttering of the country’s largest opposition newspaper. There appears to be little doubt in anyone’s mind that Mediaworks, the publisher owned by Vienna Capital Partners, agreed to do the dirty work for business interests affiliated with the ruling Fidesz party, when with no warning it unceremoniously pulled the plug on the nation’s largest daily newspaper and erased its website. The most touching gesture of solidarity with Népszabadság came from neighbouring Slovakia. 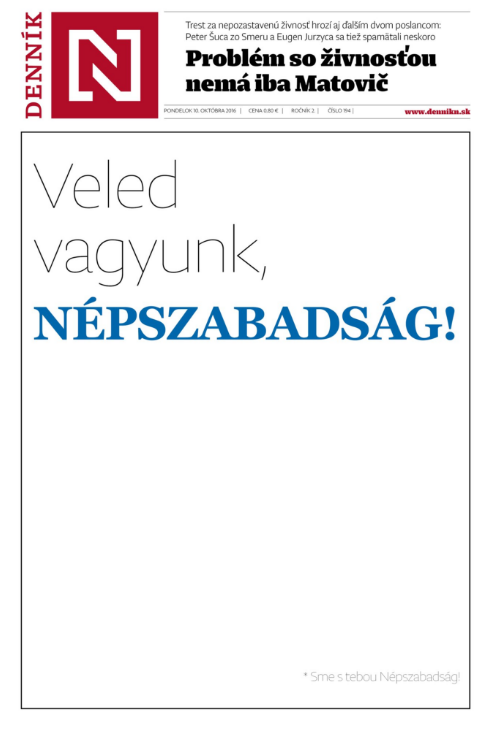 A Slovak daily newspaper, Denník N, published a blank cover page Monday morning, bearing only the Hungarian-language headline: “We are with you, Népszabadság! Denník N’s article, written by Peter Morvay, indicates in no uncertain terms that “Népszabadság is a victim of government revenge.” It then mentions Népszabadság as Hungary’s “most important daily, ” and adds that the paper’s last issue published a cover story on Fidesz corruption and that another such story was forthcoming. The cover page of Slovakia’s Denník N on Monday. The editors of the conservative Mandiner website also issued a statement in solidarity with Népszabadság. The publication quoted Hungary’s constitution, introduced by Fidesz in 2011, in which it calls (on paper only) for a diverse and free media. “The diversity of the press is important to all of us. Without it, public discourse becomes warped and Hungary’s truly diverse society goes unheard. When diversity is eroded, for whatever reason, Hungarian democracy is abraded too,” write Mandiner’s Gellért Rajcsányi, András Stumpf and other members of the editorial team. Magyar Nemzet, a conservative daily that has gone through a major transformation in the last 18 months and is now actually quite critical of the Orbán government, issued several scathing critiques of Népszabadság’s demise and has placed the blame right where it belongs: with Fidesz. “Népszabadság is valuable. It is a brand and it is a nicely edited, independent paper. 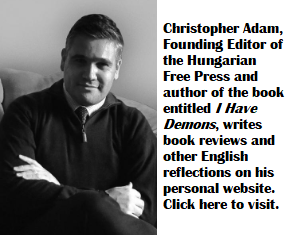 It is a useful news source on events in Hungary and in the world. It is full of thoughtful and of course provocative articles too….Népszabadság was most certainly not closed as a result of market-based decisions. In the background towers over it politics and the government’s hypersensitivity, which finds it increasingly difficult to tolerate critical voices,” wrote Gábor D. Horváth in Magyar Nemzet. Of course, what remains of Hungary’s left-centre media protested as well. Népszava, the country’s only remaining left-wing print daily, launched a petition on its website, calling for the resurrection of Népszabadság and press freedom in Hungary. You can sign the petition here, and I would strongly urge HFP’s readers to do so–I already have, and so has one of our regular readers, Stevan Harnad, from Montreal. “The shuttering of Népszabadság is a red line in the sand that we must not cross. We must not allow for this national treasure to be lost and we must protect press freedom together. It is the responsibility of us all to stop this process. If there will be enough of us and if we are determined, we can stop this travesty”–writes Elza Láposi, Népszava’s publisher and Péter Németh, the paper’s editor-in-chief. This image greets readers of Népszava. On Monday, the Democratic Coalition opposition party, led by former Prime Minister Ferenc Gyurcsány, announced that the shuttering of Népszabadság was the final drop in the bucket. His party, which has four MPs in Parliament, would permanently boycott all parliamentary hearings, committee work and question period from now on. The only exception will be when Fidesz requires a two thirds majority to pass legislation, at which point, of course, DK will vote against the government on critical issues. Mr. Gyurcsány told journalists that his party’s MPs understand that they will lose their income. “If we don’t take this step, the Democratic Coalition will also become a cog in the wheel of the Regime of National Cooperation,” declared Mr. Gyurcsány, using the term introduced by Fidesz when speaking about the Orbán government. Meanwhile, Népszabadság’s editorial team is still holding out hope that they might be able to reason with Vienna Capital Partners’ Mediaworks company. On Monday, the paper’s editor–András Murányi–had a meeting scheduled with the publisher. The firm, however, cancelled the meeting last minute, claiming that one of the negotiators fell ill. Thus far, the future of Népszabadság looks grim. But Fidesz may have miscalculated this latest assault on democracy. The way they did it was something. My guessing is that they were afraid of letting them possess the publication even for one minute after sacking them and closing the paper. They were terrified even by a chance they can publish something about it. As of the HUF five billion in losses, I find it a bit too high, anyway it tells me nothing, I don’t know whether I can believe it or not, I might believe it if they could present a trustworthy breakdown of their budget. I personally wasn’t a reader of Nepszabadsag and I think it addressed a relatively smaller group of readers but I think what had happened possibly will not get forgotten and forgiven for some time. Also, the attention might easily be redirected to the left and the opposition for their letting Nepszabadsag be killed off just like that. They might protest and do something but too little too late. But it is not going to happen now. Tomorrow new questions might be asked addressing the opposition and the left. Of the many comments above, István Dévényi’s is perhaps the most appropriate. The shutting down of Népszabadság was not a market-driven maneuver – the media “market” in Hungary is entirely under the political control of Orbán’s “illiberal” State. It’s the government controlled licensing authority that controls market entry, content and the rules of competition. Orbán uses tax-payer’s money via targeted and preferential advertising spending, preferential tax-instruments and investment loans to enhance the competitive advantage of media outlets that are supportive of his corrupt regime. The destruction of Népszabadság is just the most recent illustration of this uneven playing field. Additional recent examples include the awarding of one of the country-wide private TV channels to Orbán’s tax-dodge advisor, Andy Vajna (he was granted a massive government loan at preferential rates to purchase the station, and license/advertising perks to enable him to be far more profitable than his predecessors), Another recent example involves the establishment of Magyar Idők, or the state-capture of the country’s largest on-line media, Origo. There is nothing new in the Népszabadság story. It is simply another step in a 6 year long process towards eliminating competition in the media market. All of that has taken place under the radar of the EU’s media guidelines. The entire anti-liberal, anti-refugee, anti-democratic, anti-civil rights disgrace that is Hungary today, has been made possible by the EU’s massive financial subsidies, Europe’s unwillingness to uphold the ideals and principles it had sworn to defend, and last but not least, by Hungary’s incompetent and disorganized democratic opposition. Chris, please feel free to announce that this latest outrage on freedom, honesty and decency by Orban — just one of a growing litany of such Orbanian abominations being witnessed mutely, without protest, by the Hungarian Academy of Sciences — has at last prompted me to do what I had been contemplating for some time, and should have done long ago: I resigned my external membership of the Academy on October 8. My shamefully late gesture was prompted by the initiative of Professor Thomas Jovin of the Max Planck Institute for Biophysical Chemistry who resigned a few hours before I did. I hope all external members whose consciences are dearer to them than their CVs will do likewise. Any expression of solidarity when Pesti Hírlap was closed… or when the office of weekly Demokrata was vandalized…. that’s what the Szabad Nép’s heir deserves. Why complain? They were just shut down and can get in the soup line. Orban’s idols Putin and Erdogan have the newsmen killed or jailed. Only a couple of free papers to go. No problem, go assuaging yourself further on, little sweet Charlie and tell me when you’re O.K. 😀 😀 — you’re so funny hehehe you made my day again.